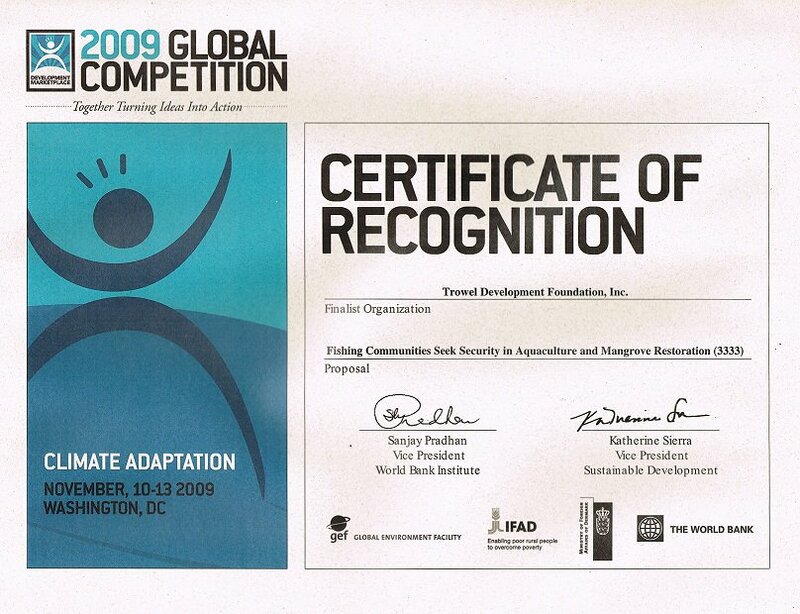 ​​​​​​​Trowel won four international and national awards, namely: World Awardee and Finalist, Energy Globe World Award of Austria, 2017; United Nations Development Program Equator Prize 2010, New York; World Bank 2009 Global Competition on Climate Adaptation, Washington DC; and World Bank 2008 Panibagong Paraan Project Grant Competition, Philippines. Members of local farmers, fishers and women organizations restored about 100 hectares of denuded mangrove areas and idle fishponds by planting some 797,000 propagules and seedlings of Rhizophora species. Four villages covered by the mangrove restoration efforts included Barangays Barobaybay and Sabang Tabok in Lavezares, and Jamoog and San Lorenzo in Rosario, Northern Samar province. The mangrove trees were found to have grown to as high as ten feet tall and are growing robustly based on the last inspection of the mangrove areas conducted by Trowel in December 2016. The original recipients of the project benefits in Barangay Bonifacio, Lope De Vega in the province of Northern Samar successfully passed on the gifts to 39 poorest families in Barangay Getigo following the Passing-On-The-Gifts (POG) scheme. The gifts consisted of a carabao, two piglets, ten chicks, several packets of vegetable seeds, cultivation tools, and implements, and knowledge sharing on organic farming and animal health management. The POG is adopted and popularized by Trowel through its SHARE A LIFE (Sharing and Harnessing Agriculture and Resource Endowments Always for Improvement of Local Income, Food, and Environment) Project.